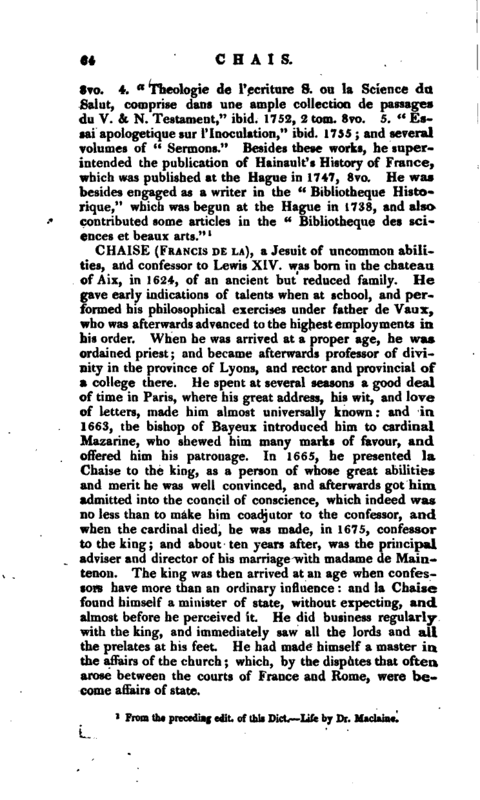 , an eminent protestant divine, was born in 1701, at Geneva, where he probably received the first rudiments of education. The church being chosen for his profession, after passing through the usual probationary exercises, he was admitted into the order of | priesthood. In the ministry his reputation as a preacher and an orator soon became so popular and extensive, that in 1728 he was elected pastor at the Hague, and his conduct in this establishment, while it contributed to his own reputation, redounded no less to the honour of those who had appointed him. Having adorned his ministry by the purity of his manners, the excellence of the discourses which he delivered from the pulpit, and his numerous writings in defence of revealed religion, he died in 1786, at the age of eighty-five, after having punctually discharged his duty as a pastor during the period of fifty-eight years. 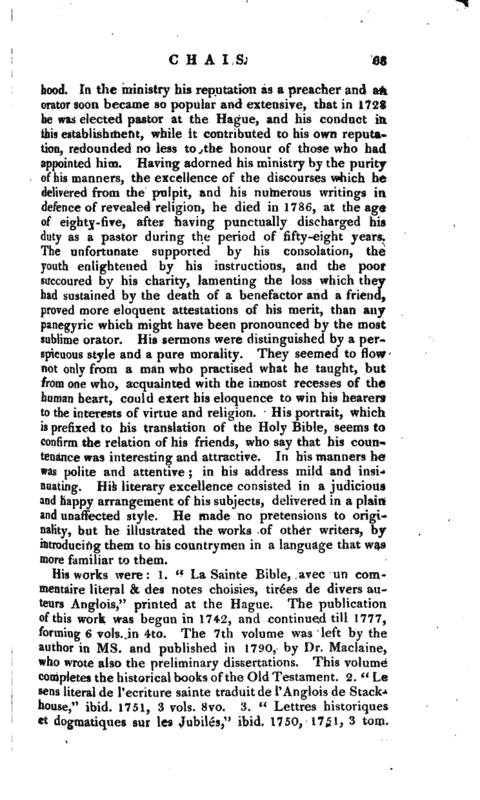 The unfortunate supported by his consolation, the youth enlightened by his instructions, and the poor succoured by his charity, lamenting the loss which they had sustained by the death of a benefactor and a friend, proved more eloquent attestations of his merit, than any panegyric which might have been pronounced by the most sublime orator. His sermons were distinguished by a perspicuous style and a pure morality. They seemed to flow not only from a man who practised what he taught, but from one who, acquainted with the inmost recesses of the human heart, could exert his eloquence to win his hearers to the interests of virtue and religion. His portrait, which is prefixed to his translation of the Holy Bible, seems to confirm the relation of his friends, who say that his countenance was interesting and attractive. In his manners he was polite and attentive; in his address mild and insinuating. 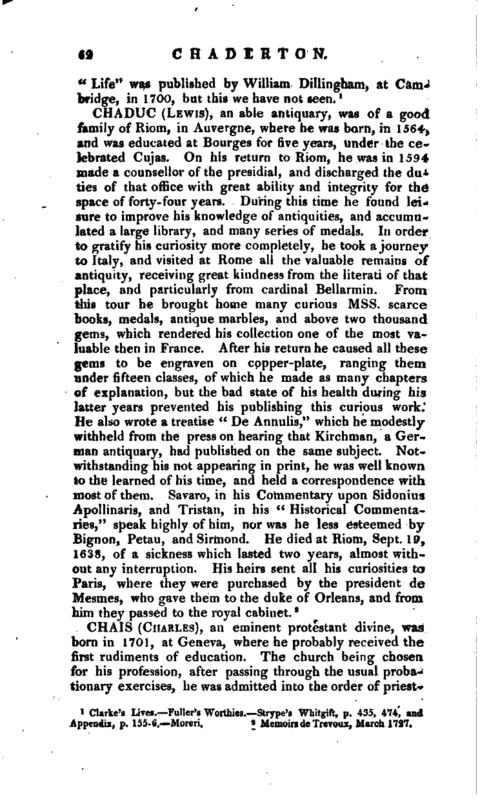 His literary excellence consisted in a judicious and happy arrangement of his subjects, delivered in a plain and unaffected style. He made no pretensions to originality, but he illustrated the works of other writers, by introducing them to his countrymen in a language that was more familiar to them. From the preceding edit. of this Dict.—Life by Dr. Maclaime.